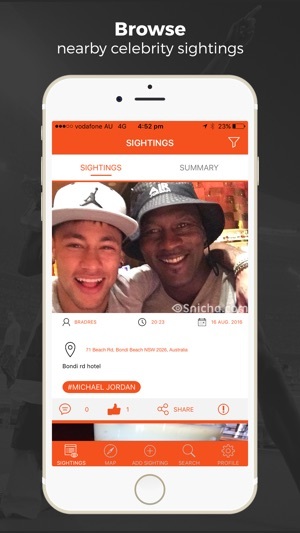 Snicha is a new and exciting FREE app that brings you closer to your favorite superstars and sports celebrities! Browse recent sightings, add your own, or simply interact with fellow fans to increase your chances of seeing celebrities in real life, at a location nearby. 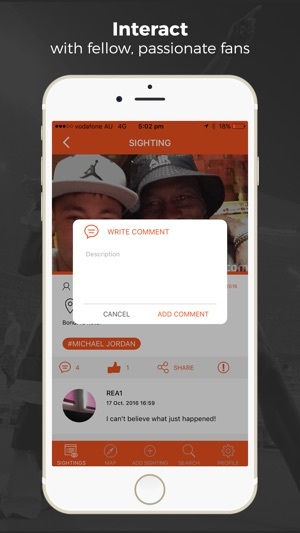 Real fans are hungry for real time interaction with their favorite sports stars or celebrities! Watching them in the news is simply not enough. We know that getting close is not easy; there are few available tools that maximize your chances of seeing them in real life. Current apps provide insufficient content and there are few communities to share your exhilaration when you do find them! THAT’S WHY SNICHA WAS CREATED! Snicha is a brand new app that brings superstars and fan communities together. Our unique features allow you to vastly increase your chances of seeing your favourite stars nearby, while interacting with true fans just like yourself . Being a community-driven app, it’s you, the fans who create, share and drive the content on Snicha! 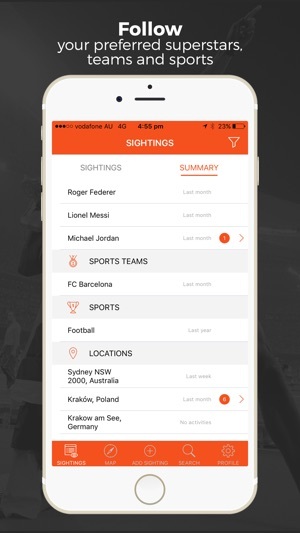 Discover where your favorite team was last sighted or where your favorite celebrities are hanging out. Snicha makes it easy to follow your preferred teams and superstars! Equipped with a highly intuitive design, Snicha provide sports fans around the world with a fun, social and interactive experience, and a real chance to create life-changing memories! ADD YOUR OWN CELEBRITY SIGHTINGS: Finally located your favorite superstar out and about? Post your photos on Snicha and exhibit your fortune with our vibrant community. Share your passion and enthusiasm with other fans globally. BROWSE NEARBY CELEBRITY SIGHTINGS: Browse through the latest celebrity sightings that were reported nearby! Snicha's unmatched real time sightings will rapidly increase your chances of seeing someone you love, up close! FOLLOW YOUR PREFERRED SUPERSTARS, TEAMS & SPORTS: Snicha was created by fans, for fans! We work hard to provide you with a personalized app that can be fully customized to your needs. Tune your app to follow your favorite superstars, teams and sports so that you’re always one step ahead, and increase your chances of a lucky, meaningful encounter. INTERACT WITH FELLOW, PASSIONATE FANS NEARBY: Sports is all about uniting fans that share the same passion, bringing them together in the same colours. Our app is community-driven, giving you the chance to interact with other fans, both near and far, to share your excitement, your stories and your 'once-in-a-lifetime' photos! Wait No More! DOWNLOAD Snicha Today & Go Meet Your Sports Heroes In Real Life! - Now you can enjoy two useful views under 'Sightings'. Firstly you can view all the latest trending sightings. Secondly you can view your favourite sightings based on the filters you've opted for. 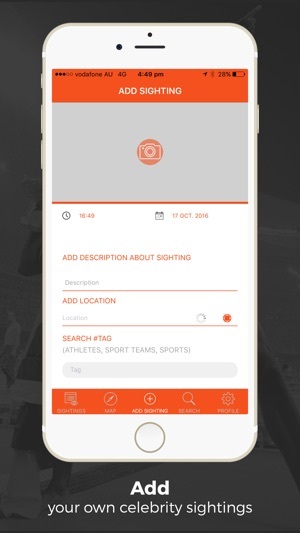 - We've simplified how you can add/remove filters to capture sightings for only your favorite celebrities, sports teams, sports and locations. This is all managed via a single screen, accessible by the 'Filters' option in the main menu. 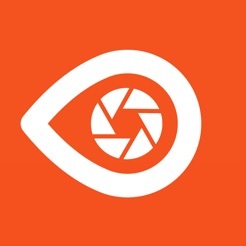 - You can now pick a photo from your photo gallery in addition to taking a live photo. Our system will intelligently capture your photo's original time, date and location if available. If the location of your photo is not available, you will be prompted to provide it before submitting your sighting. - Finally, we've cleaned up the app a bit and fixed a few bugs that were apparent. Let us know if you have any fresh ideas, suggestions or issues on your end via: http://snicha.com/contact. This app has potential to be the next big thing in social media. Well designed, easy to use and exactly what fans are looking for - intel about celebrities and sports people.